Anyway, I had this brainstorm. I had been wanting to do a calendar for 2009 using my scrapbooking supplies. So, I made a calendar - postcard size. But, this isn't just a calendar, it's a mini photo album. You can pop in pictures of the kids, dogs, cats, or whatever, and using the service offered by the post office, you can mail them to friends and family each month. What better gift to give Grandma and Grandpa, Uncle Joe or Aunt Sally. who live far away? Keep them updated on the kids with a new picture each month. These postcard calendar pages will fit into a 4" X 6" frame, and can be displayed on their desk, wall or even the fridge. Want a preview of what they look like? 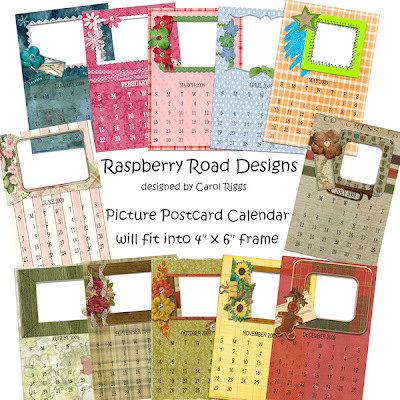 You can purchase this set of picture postcard/calendar pages for $2.99 at Raspberry Road Designs new store. Just click on the title to this post and it will take you there. As a bonus, I have included calendar pages for November and December 2008. Those pages are not include on the preview. OMGSH you are clever! I love this idea and your designs are amazing. Well done gf. Love what you have made and thank you so much :))What a good idea you had!! I've given you an award on you awesome page!! !